FOXBOROUGH, Mass. – A pair of 16-3 teams that upset higher seeds in the semifinals meet in Monday’s 1 pm national championship men’s lacrosse game at Gillette Stadium. No. 3 Yale, which beat No. 2 Albany 20-11 on Saturday, faces No. 4 Duke, 13-8 winners over top seed Maryland. The 2018 NCAA title contest airs live on ESPN2 and on ESPN Radio (1300 AM, 97.9 FM). Monday is the 16th meeting between the Duke Blue Devils and Yale Bulldogs with the ACC squad holding an 8-7 series lead. They have never met in the postseason. Duke has won the last 4 meetings, including a 14-6 decision in Durham in 2009. The last time these schools met in a post-season contest, Duke held off an enormous second-half run to edge Yale in the 2016 NCAA Men’s Basketball Tournament at Providence, RI. Andy Shay, coaching his sixth season at Yale, was in the middle of what would be a 5-8 campaign when his Bulldogs traveled to Durham in 2009. Bulldog brothers Brendan and Matt Gibson combined for 5 goals and 7 points, but their squad could only produce one other tally in a 14-6 loss to the Blue Devils. The current Bulldogs, who have gone further in a season than any other Yale team, have equaled the school record for wins in a season (1990 team). The 2018 Elis are also the most decorated in the program’s history, including 6 USILA All-Americans and the winningest class. Matt Gaudet scored 6 times on 8 shots, Ben Reeves posted 9 points including 5 goals and Jackson Morrill contributed 3 goals and 5 assists in Yale’s most prolific NCAA Tournament game ever, a 20-11 win over Albany on Saturday. Jack Starr made 7 saves while Conor Mackie won 15 faceoffs. Yale was awarded a lacrosse “national championship” in 1883 (yes, that is right, 135 years ago) but has never won an NCAA title. The last Ivy League men’s lacrosse team to play in a national championship game was Cornell, which lost 10-9 in OT to Syracuse in 2009. The last Ivy NCAA champion was the 2001 Princeton team that beat the Oraungemen by the same score in OT. The 6 goals by Matt Gaudet are the third most by a player in an NCAA semifinal. He is the second Bulldog to record that total; Jon Reese ’90 hit the net 6 times vs. Loyola in 1990. Duke, which owns 3 national championships since 2010, is in its 22nd NCAA Tournament. The Devils, 36-18 overall in NCAA Tournament action, have 5 USILA All-Americans on their team this year who have helped the squad go 11-0, when holding opponents to single digits scoring. Duke has won 4 straight. Yale tied a record for most seniors taken in a single draft when 6 players were selected in the 2018 Major League Lacrosse Collegiate Draft. Ben Reeves (4th overall, Dallas), Tyler Warner(11th, Florida), Christopher Keating (23rd, Dallas), Jason Alessi (39th, Charlotte), Conor Mackie (41st, New York) and Jerry O’Connor (61st, Florida), were all selected. Ohio State (2017), Maryland (2016) and Virginia (2006) also had 6 taken in a single draft. With one goal and two assists in the finals, Ben went on to win the coveted Tewaaraton Award. This prestigious award is given annually to the most-outstanding American college lacrosse player. 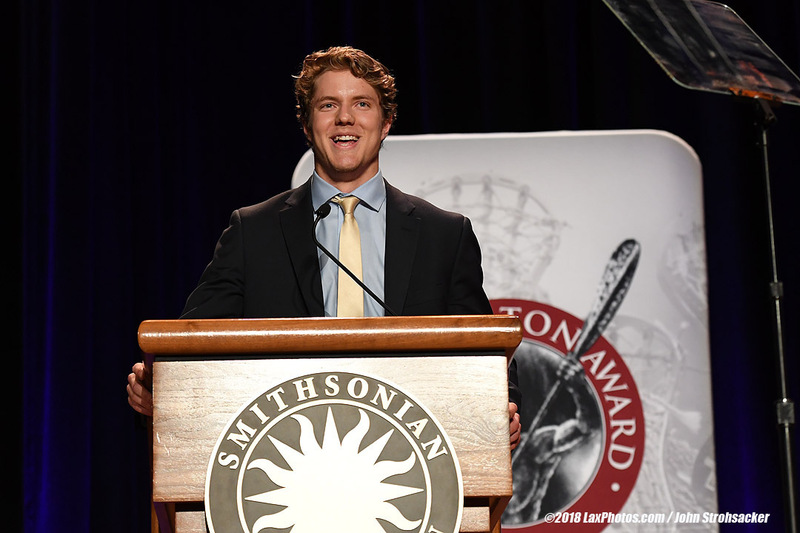 The 18th annual Tewaaraton Award Ceremony was held May 31, 2018 at the Smithsonian Institution’s National Museum of the American Indian in Washington, DC. At the ceremony a strong Eli contingent was on hand to see Reeves win the award for the best male lacrosse player for the 2017-2018 collegiate year. Reeves, a true scholar athlete, majored in molecular, cellular & developmental biology. He graduated in May, 2018, with a 3.89 GPA. One summer he shadowed cardiac surgeons in Africa as they worked on impoverished children. He also worked in a Yale cancer research lab, focusing on cancers found in the blood (leukemia), and then spent a summer working at the University of Rochester doing research on tumors of the neural crest while shadowing a pediatric oncologist at Strong Memorial Hospital. He will continue his medical research at Yale in the fall of 2018. Points: 10 (5 G, 5 A) vs. Brown (4/15/2017); Goals: 5 vs. Albany (5/26/2018) and 5 vs. Brown (4/15/2017); Assists: 5 vs. Brown (4/15/2017). Or we could just say Reeves crushed Brown in 2017. Senior Conor Mackie is a crucial component for the Elis at FOGO. Mackie went 15 for 32 on the X with face-offs against Albany, while recording a team-high 7 groundballs. He now ranks fifth in the nation in groundballs per game (9.63), and is first in the Ivy League in face-off winning percentage (63.3%). He was named a 2018 Inside Lacrosse Third Team All-American. Mackie went 246-408 (60.3%) on face-offs in 2017, which ranked 10th in the nation and first in the Ivy League. He was also third in the nation with 8.88 ground balls per game. Earlier this season, he went a perfect 15 for 15 on the X against Fairfield. Ten members of the class of 2018 have helped Yale to an overall record of 50-17 since 2015. That includes three Ivy League Tournament titles, three consecutive NCAA Tournament appearances and two regular-season league championships. The 50 wins by the Class of 2018 is the Yale all-time record for wins by a class. The seniors include Attack Ben Reeves, Midfield Tyler Warner, Defense Liam Kelly, Defense Christopher Keating, Midfield Will Robinson, Defense Jerry O’Connor, Midfield Conor Mackie, Defense Ryan McQuaide, Midfield Owen Jones, and Midfield Jason Alessi. Senior Tyler Warner has played a key role as a short-stick defender for the Bulldogs. The Inside Lacrosse First Team All-American is often responsible for covering some of the best attackmen, but can also find balls on the ground and distribute in the offensive end. Warner continued his impressive streak of performances with two groundballs in the win over Albany, while covering one of the best attackmen in the nation in Connor Fields. He now has 44 groundballs and 14 caused turnovers (both career-highs) on the year. Warner finished the 2017 season with 29 groundballs, and was given an honorable mention in the 2017 USILA/Nike All-America roster. Two-sport Division I athletes are unique, even more so are key players for both teams. 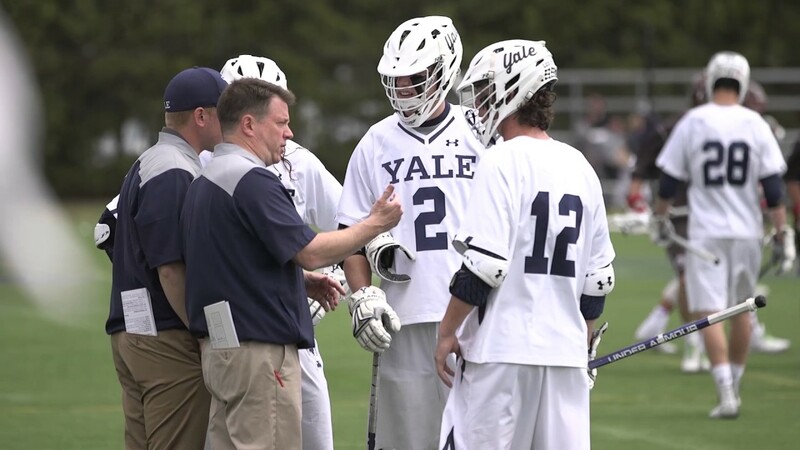 Senior midfielder Jason Alessi is the best male example at Yale, starting on defense for the Ivy champions Yale football team, while making plays for the lacrosse team. In the National Semifinal game against Albany, he had a career-high two assists. He now has five goals and six assists on the year. Alessi had 17 tallies in 2017, along with eight assists, 22 groundballs and two caused turnovers. He finished the 2016 season with 12 goals and 2 assists, including three multi-goal games. On the gridiron, the defensive back is the only player in Yale history to record a pair of punt returns for TDs over 80 yards. He was named to the All-NEILA second-team at the end of last season. Sophomore Jackson Morrill continued a growing streak of impressive playoff performances for the Yale offense, recording three goals and a career-high five assists in the win over Albany. So far this tournament (3 games), he has ten goals and eight assists. In the first round win over UMass, he tied classmate Matt Gaudet for the most goals scored by an Eli in a single game since 2012, and the third-most goals scored ever in an NCAA First Round game (7). Earlier this year, he had another seven point performance (5 G, 2 A) against Dartmouth. He now has 71 points on the year (40 G, 31 A), the second-most on the team, and the sixth-most ever for a Bulldog in a single season. His 51.3% shooting percentage is seventh in the nation. Morrill finished the 2017 season third on the team with 39 points (20 G, 19 A). He is a member of the Morrill family, which is the only family in history to have three generations of players inducted into the US Lacrosse Hall of Fame. Junior Jack Tigh was held without a point in the win over Albany, but is a constant threat from the perimeter as a shooting midfielder. His season goal tally is at 32, the fourth most on the team, and he averages 2.42 points per game. So far this season, he has set career bests in points, goals, and assists in a game. Tigh has been a three-year starter for the Yale offense, and he finished last season with 17 goals and four assists. He has 85 career points (59 G, 26 A). Sophomore Matt Gaudet was a force in front of the crease for the Yale offense, scoring a game-high six goals in the win over Albany. Earlier this month, he tied classmate Jackson Morrill with seven goals in single game, the most by a Bulldog since 2012. His season goal tally is at 37, the third most on the team. The Ontario native, like teammate Jack Tigh, has set career bests in points, goals, and assists in a game. Gaudet has scored 15 goals in his past five games played. Senior Christopher Keating has been a staple of the Yale defense so far this season. His 1.33 Caused Turnovers (CTs) per game rank second in the Ivy League. He now has 54 groundballs and 24 caused turnovers on the year. He was given an honorable mention in the 2018 Inside Lacrosse All-American list. In 2016, he also ranked third in the nation in caused turnovers per game (2.13). During that same season, Keating recorded 59 groundballs and 34 caused turnovers, and led the team in both categories. He has also extremely efficient on the clear, having only given up six turnovers this season. First year Chris Fake has been one of the most dominant defenders in the nation, and his success has continued into the NCAA tournament. Fake has started in every game this season, and has been responsible for marking all of the top threats from opposing teams. The Allentown, New Jersey, defenseman was named the 2018 Ivy League Rookie of the Year, and was recently named a 2018 First Team All-American by Inside Lacrosse. He has 25 groundballs and 16 caused turnovers this season, which includes a career-high four CTs in the win over Albany during the regular season. Sophomore Aiden Hynes was sidelined with injury earlier this season, but has come back to be a critical part of the Yale defense. In only 14 games this season, he has 17 groundballs and 13 caused turnovers, including 10 CTs in his past five games. He finished the 2017 season with 16 groundballs and a team-high 18 caused turnovers. First year goalie Jack Starr has made crucial saves in key moments during the three NCAA tournament games this year, and recorded 7 saves in the win over Albany. He averages 7.44 saves per game this season, and has a .479 save percentage. Earlier this season, he recorded 15 saves in a regular-season win against UMass. It is exciting to see the Bulldogs on the NCAA stage for the first time in the finals. They deserve the accolades this year, as their play on the field has been remarkable in its intensity and killer instinct. 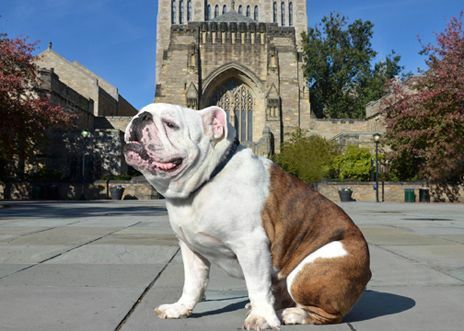 Boola, Boola, go Lax Bulldogs! And girls out there, hide your hearts, as Eli’s comin’ for real.